2 Colleges: Which One Is Stingy? How do you know if a school is going to be generous to your child? Here’s a quick answer: Check the numbers. Or as I like to say, check the financial fingerprint of any school that’s on your teenager’s list. There are many ways to determine whether a school is generous or not, but today I’m going to focus on the College Board’s resource. I’ll be focusing on two schools — Occidental College and New York University – to provide a quick lesson in what you can learn from some easy detective work. I picked Occidental because I wrote about the school in yesterday’s post and because it will serve as an example of a college that provides excellent financial aid. NYU will serve as an example of a school that provides mediocre financial aid. You can find the financial statistics of any school by heading to the College Board and typing the name of a school into the College Search box, which is located on the upper left hand side of the home page. Once you arrive at the school’s profile, click on its Cost & Financial Aid link. I am always interested in seeing what a school’s average percentage of need met is. In Occidental’s case it’s 100%, which is excellent. Only about four or five dozen schools in the nation can claim to meet the average student’s full demonstrated financial need. I also checked to see how many students who were offered aid had their full need met. As you can see all 340 of the Occidental freshmen fit into this category, which again is great. In addition, the average scholarship or grant for students requiring help is high versus the average loan. For wealthy students who wouldn’t qualify for any need-based aid, this school also awards scholarships – non-need based aid — with the average being $9,580. I also am always curious about the indebtedness of graduating seniors. Once again, Occidental excels in this area. 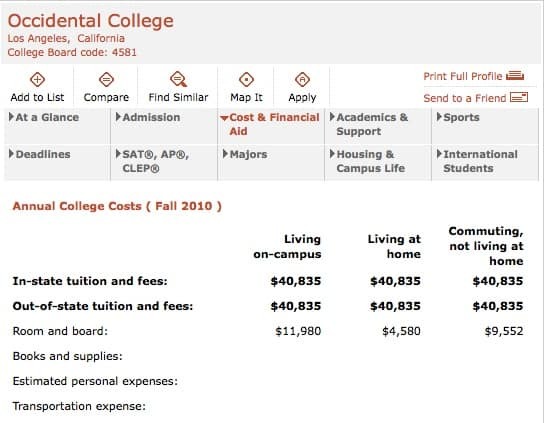 The average Occidental student, who borrows for college, graduates with debt of $17,561, which is far below the national average of $24,000. Just like Occidental, NYU is a very expensive school, but let’s see what kind of financial-aid break NYU gives its students. 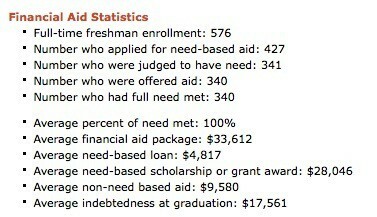 After looking at NYU’s financial aid stats, it’s easy to conclude that this a stingy school. You can see that NYU only meets 69% of the typical student’s financial need. This percentage is far, far below many highly selective and elite schools. What’s just as disturbing is what the school does not reveal. I am always suspicious when a school doesn’t divulge what the average indebtedness of its students is at graduation. 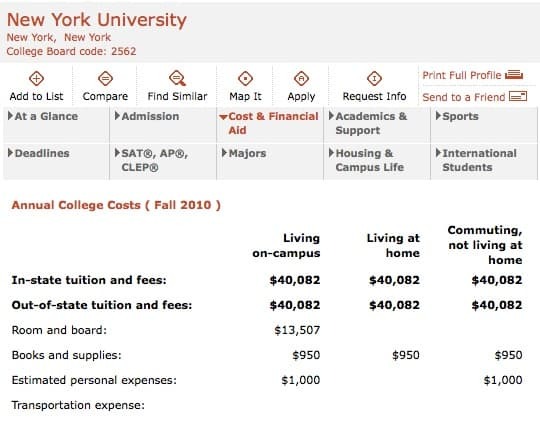 I looked at another document – NYU’s Common Data Set from the 2008-2009 school year that says that the average indebtedness of the typical NYU student is $34,850. That is extremely high. What’s also concerning is that NYU doesn’t reveal the number of students who have their full financial need met. I think you can guess why the school keeps this number a secret. When you are drawing up a list of college, make sure the colleges are not only academic fits, but financial ones too. College costs far too much to not understand what kind of financial commitment you will face. One Response to 2 Colleges: Which One Is Stingy? 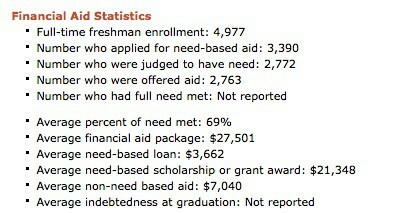 I’m curious about the “indebtedness at graduation” figure. Specifically, how is it calculated? How do schools determine the total debt incurred (numerator) for a particular class? What is used for the denominator – the TOTAL number of students in the class OR the total number of those who borrowed during their college years? It seems that there may be many students whose EFC may disqualify them from financial aid but who must borrow to write the checks. Are they included in the calculation? I would find the average EFC per class to be an interesting statistic. Does it exist?